Every couple of years, the normal schedule of televised sport is upset by a two week long global tournament of sports and games. The Olympic Games make their entrance with a grand orchestral tune and promise to award many precious medals. The basic contradiction of sports broadcasting applies here too—the majority of people involved are doing the exact opposite of participating in athletics. Instead, they sit on a couch or in a chair, watching a screen. In the case of the Olympics, where the stakes are higher and world records are up for grabs, how does the viewer’s experience change? In other words, what does it mean to watch ‘the best of the best’? 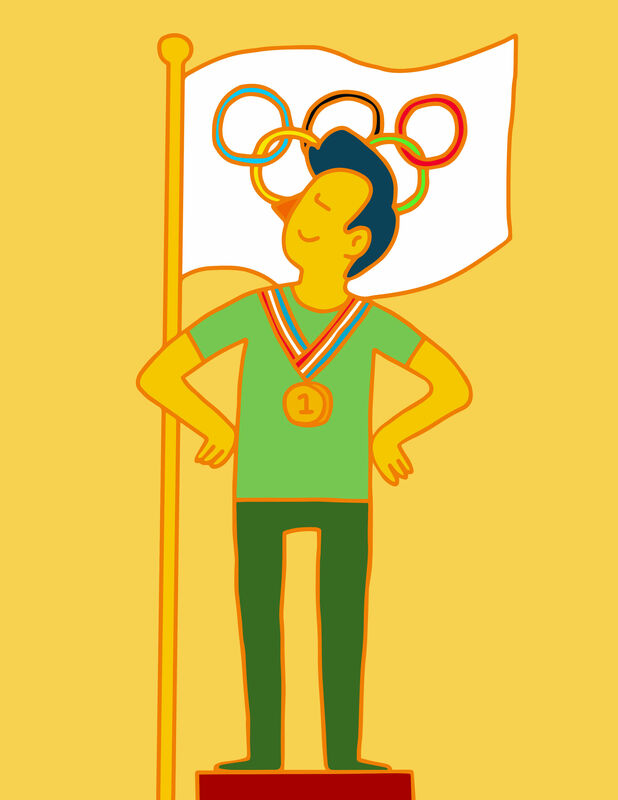 The Olympics, more than any other televised sporting event, profiles individual performance and individual achievement. Most regularly aired and viewed sporting events involve teams, with the exception of tennis and golf. While these more common sports have a place at the Olympic games, they take a backseat to the more unusual individual events, many of which only show up on viewer’s screens once every four years. By nature of their rarity, these events in some way define the Olympics as a stage particularly defined by its individual performances. If one general purpose behind the Olympic Games is the identification of ‘the best of the best’, then the actual feats completed by the athletes promise to be of top quality and skill. The ideal of absolute universal dominance animates the performance with a superhuman quality; the gold medal winner is, after all, the most super of humans at their sport. And most often, the highest of skill levels does not visually disappoint. There are spins in the air and turns on ice, there are heights and speeds reached that redefine the limits of the human body. While the witnessing of ‘the best of the best’ inspires awe in the moment, it is difficult for the viewer to know where to turn after this instant emotion. As viewers, after watching something so extra-human, we must come back to terms with our own unchanged reality, our couches and living rooms, and our simple humanness. It is not clear what to do with our amazement at a superhuman act: What can we do with it? What is its use? We don’t know what to do with all the greatness. If we wish to retain any level of the romance of the Olympic feat, we have no other place to turn but back to the screen. Specifically, we might look to the only one whom the result of the event will certainly have effect: the athlete. In an attempt to understand what it means to the athlete to be completing this feat, the viewer will now take up a project of finding the person in the athlete, or humanizing the superhuman. To reach a relatable human quality in the Olympic Games is to unearth the individual from a dehumanizing structure of objectives. To produce objective winners, the design of the tournament reduces the individual athletes to approachable units. Homogenized bodies, each reduced to name, country, and eventual score or time, and each a similar shape and in similar dress, act as action figures. On the screen, we watch the body move through positions and actions that are not only unfamiliar to the average range of human movement but also standardized within each event. Each achievement calls for specific formulae that dictate how the body should move to achieve an ideal result. It is not creativity that generates such unusual body shapes and actions, but an external set of rules, similar to the clear rules that will decide how the performance is scored. This is especially evident in races, where the plurality of figures moving their bodies in the same way abstract human bodies into something more mechanical. When pictured from far away, the racing athletes could be any sort of uniform object. For the most part, Olympic television programming contributes to this dehumanization. The number of events and limited time require speedy and spare coverage that ends once the results are decided. A concentrated screen means that the image of the athlete is never free of numbers. Sleek, plastic looking bands and bars, often dotted with corporate logos, clog up the image of the athlete in their environment. The network transitions into advertisements only after reducing the performances to names and numbers, displaying them all together in a list. The major divergence from such an objectively-interested and formulaic structure takes place at the end of each event. For the brief moment that a rigorous schedule allows, the viewer watches the superhuman performer make the transition into conventional, upright personhood. The expected exhaustion and general stimulation leave the athletes raw, or unprocessed. Here the athlete is most human, as much as ‘human’ means a reflection of the viewer on the couch. For a few seconds or minutes, before they become aware of themselves or their results, we see a human without a comprehensible feeling, only the suggestion of feeling itself. But after a few minutes, the visible emotions congeal into something more clearly categorical. We see on their faces joy and disappointment, alternately, a combination of both. Tears exaggerate the simple and digestible emotions and turn the characters into approachable, more relatable characters. As the Olympic structure transforms athletes into units for competition purposes, the athletes are simultaneously flattened into an emotional unit for the audience to consume. The awkward balance between humanization and distance exposes itself in the marginal Olympic spectacles outside the events themselves. The Olympic interview, when shown, perhaps promises the most clear insight into the genuine nature of an athlete. However, an interview usually dissolves into a recitation of basic lines: “I went out there and tried my best,” “I am just so happy to be here,” “I have been looking forward to this day since I was a little girl.” At the medal ceremonies, emotion again appears flattened and performative as the athletes step onto podiums of different heights, spatially configuring their objective results. While emotion is not missing, the emotional subjectivities that a viewer uses to humanize the performances become almost as formulaic as the scoreboards. If we, as viewers, are left confused as to what to do with the awe we experience when we witness the physical talent on screen, then we must attempt to humanize the athlete and see something of their perspective. After all, the question of why we watch the Olympics has its parallel in the question of why the athlete chose to devote the time, money, and effort of a lifetime to be this good at one thing. Beyond the physical risk of injury, the Olympic experience renders the athlete’s entire life a risk, as it has been dedicated to this sport. To put it extremely, the athlete has one chance to perform their life, and the viewer gets to watch them do it. From this we can at least extract a more clear reason for the intrigue of an Olympic feat, or an explanation beyond the awe. An Olympic performance gives us an image of a life. It satisfies an internal desire, or at least an inclination, to condense and flatten achievement into something to see, feel, or consume. The human body and its achievement, which remains as the subject of the Games, becomes palatable. But this can only emerge as a product of the tension between an imposing structure and the raw and physical body itself. Isabelle Rea B’20 got points deducted.